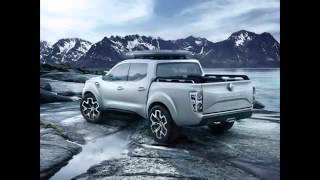 At the Frankfurt Motor Show 2015, Renault shared it’s all new midsize pickup truck concept named, Renault Alaskan Concept 2015. Scheduled to release all across the globe as a production version, the concept offers beautiful design and is speculated to have sufficient power rumbling through its engine. 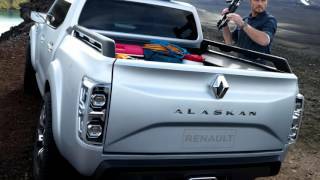 Let us have a look at the review of Renault Alaskan Concept 2015 to know more about it. The interior details of Renault Alaskan Concept 2015 are not yet released but we expect it to have luxury and space amalgamated for a better ride. Expecting charging points, some extra space for minute things, an LED for infotainment and entertainment and lots of leather with complimenting accents, is what you can surely expect from the interior of Renault Alaskan Concept 2015. But for now getting to some conclusion would be but hasty thus we would recommend you to wait till the time company shares any such detail. The exterior of Renault Alaskan Concept 2015 is truly a live example of design and engineering. With its soft curves and cutting edges, the model looks gorgeous and will surely beat the heat once out with the production version. Starting with the front fascia it has a massive company’s badge over the traditional slotted grille while the LED headlights complement the front. The muscular bumper comes equipped with the tow hooks and thus looking at them you can predict the towing capacity of the model. To keep the model rolling well even off the road, it has been equipped with the massive “wheels and come wrapped in Michelin Mud Terrain T/A tires. At the rear there is enough space for the cargo while the side mirrors come mounted with the camera system for a better view while driving. 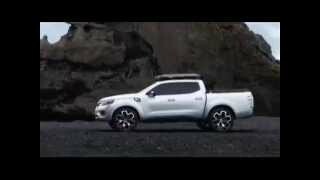 In all rounding up the exterior details of Renault Alaskan Concept 2015 I would say, it looks luxurious and performance oriented both, maintaining the aggression and boldness you dream to have in a mid-size truck. Beneath the hood of Renault Alaskan Concept 2015 will be a 2.3 liter turbodiesel four-cylinder engine. 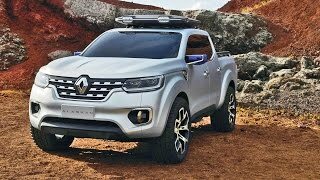 The power output and the performance figures of Renault Alaskan Concept 2015 are not yet shared but expect enough power and yes an All wheel Drive system for better ride experience.